POLICE ACTION RESULTS IN DAMAGE TO UK ECONOMY, WORKFORCE MORALE – BREAKING NEWS! Uniformed hoodlums have systematically destroyed the livelihoods of thousands of small businessmen across the UK in a 12-month rampage, according to recent statistical analysis. The “Police”, as the nationwide gang is colloquially known, sought out more than 7,800 cannabis farms in 2011, striking a devastating blow to the UK’s alternative healthcare, leisure and fast-food sectors and arguably contributing to the double-dip recession. The multiple acts of terrorism by these State-sanctioned thugs have also sent cannabis prices skyrocketing, resulting in a decline in product quality and a rise in depression, as Brits struggle to cope with the encroaching reality of the global financial crisis minus the warm fuzzy buffer-state of THC-induced inebriation. Gang leader, the self-styled “Commander” Gibson, was unrepentant, claiming that this highly specialised form of gardening poses a “significant risk” to the UK and stating unequivocally that the Police will continue to “disrupt” this line of business, described as harmful and threatening due to its links with organised crime. Yorkshire and the West Midlands, areas of notable poverty, were the worst hit by these raids, as were Devon and Cornwall – though, with the highest rise in the number of related SMEs being set up in these latter regions, economic recovery can be expected to be quicker. The “Police”, also known as the “pigs”, “filth”, “the force” and more recently the “feds” (in deference to their American counterpart), was set up in the early part of the 1800s, ostensibly to control disorder, fight crime and safeguard the law-abiding British public. However, over the years the lines of the force’s remit became blurred, as politicians manipulated the group for short-term gain and more senior force members became disillusioned by the increasing pressures of the job. The Police’s stringent entry restrictions were relaxed, and soon any old schmo with a chip on his shoulder was eligible to join. Sociopathic tendencies were not required in a trainee but certainly helped. Paranoia was rife, and fed by a growing mistrust of members by concerned Brits. By the second half of the 20th century, the force was little more than a street gang reinforcing the whims of whichever party was in government, with members forced into the shameful business of “strategic policing”, which included caging teenagers with only a joint’s-worth of weed on them, and stop-searching pedestrians for no better reason than “they looked like they were up to something” in order to fulfil arrest quotas. These latest acts of violence against British citizens are indicative of the depths to which an hitherto noble cause has fallen. 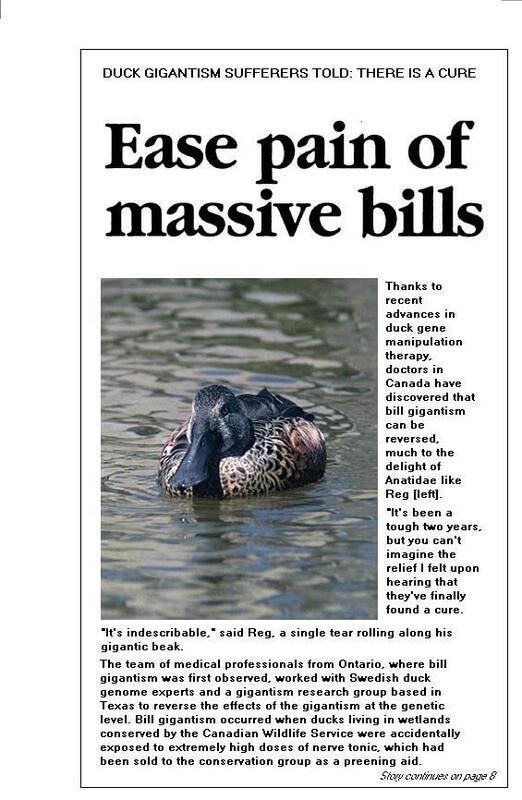 Thanks to recent advances in duck gene manipulation therapy, doctors in Canada have discovered that bill gigantism can be reversed, much to the delight of Anatidae like Reg [left]. “It’s been a tough two years, but you can’t imagine the relief I felt upon hearing that they’ve finally found a cure. It’s indescribable,” said Reg, a single tear rolling along his gigantic beak. The team of medical professionals from Ontario, where bill gigantism was first observed, worked with Swedish duck genome experts and a gigantism research group based in Texas to reverse the effects of the gigantism at the genetic level. Bill gigantism occurred when ducks living in wetlands conserved by the Canadian Wildlife Service were accidentally exposed to extremely high doses of nerve tonic, which had been sold to the conservation group as a preening aid.